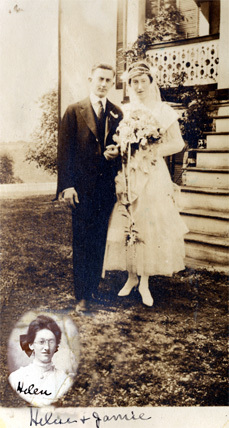 Comments: James Emmons McFarland married Helen Harris on May 2, 1919, in Scottsville. 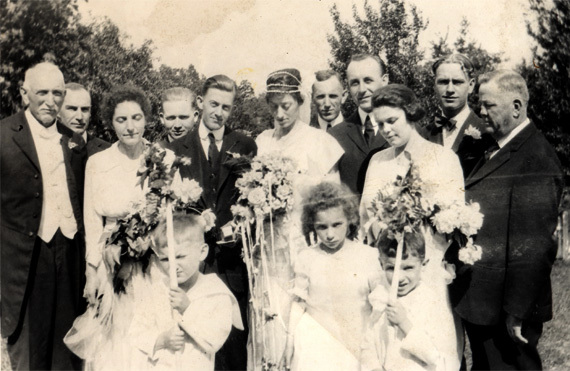 James and Helen are shown above with their wedding party at a reception at Fairview, home of the bride's parents, Charles Bascom Harris, Sr., and Helen Goddin (Crafton) Harris. 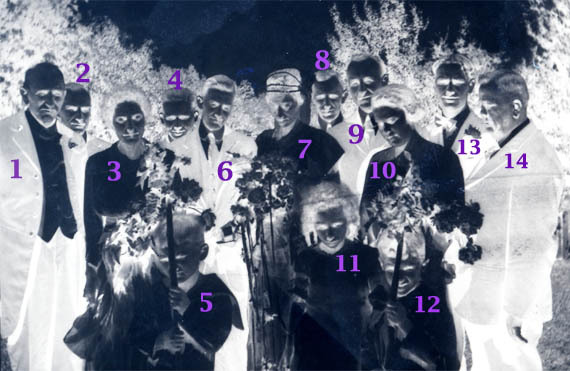 Use the image below as a guide to the names of wedding party members. Also shown at right is a portrait of the happy bride and groom. (1) Charles Bascom Harris, Sr. (1851-1930), father of Helen (Harris) McFarland. (3) Annie Parker 'Parke' (Harris) Smith (1880-1953), sister of Helen (Harris) McFarland. (5) Richard Wheat Harris (1913-1990), son of Charles B. Harris, Jr., and Alexina Lee (Harrison) Harris. Richard was the nephew of Helen (Harris) McFarland. (6) James Emmons McFarland, the groom. James was a pharmacist in Scottsville and later in Craigsville, Virginia. (7) Helen (Harris) McFarland (1892-1983), the bride. James and Helen became the parents of James Emmons McFarland, Jr. (1920), and Katherine McFarland (1924). (8) Charles B. Harris, Jr. (1883-1959), brother of Helen (Harris) McFarland. (10) Hannah McFarland, sister of James McFarland. (11) Frances Crafton Smith, niece of Helen (Harris) McFarland. (12) Charles William Smith, nephew of Helen (Harris) McFarland. (14) Samuel Gault, Scottsville's postmaster and a friend of the Harris family. These two photos are part of the Katherine Ellis collection. Katherine resides in Scottsville and is the daughter of James Emmons McFarland, Sr., and Helen (Harris) McFarland.